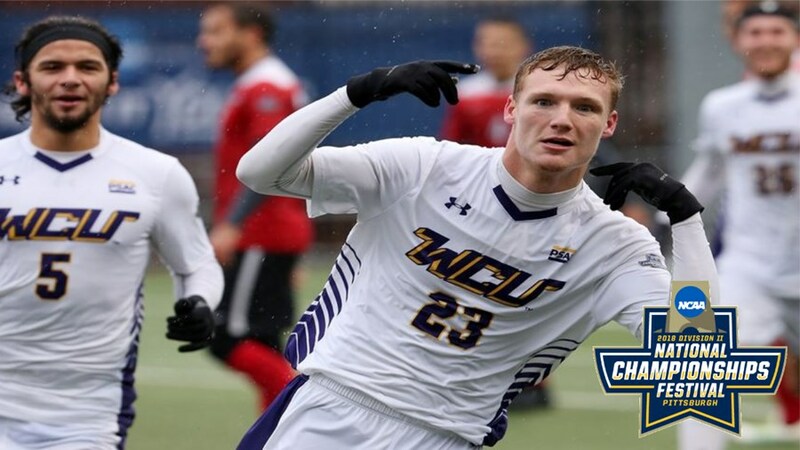 Philadelphia native Jason Pixley celebrates his first-half goal for West Chester in the Division 2 national final on Saturday. The Golden Rams fell, 2-1, to Barry University to finish second. The West Chester University Golden Rams' luck ran out on Saturday as the men's soccer team fell, 2-1, to Barry University in the NCAA Division II national final. Philadelphia native Jason Pixley scored the opening goal, which gave West Chester a lead it would hold deep into the second half. But the Bucs scored twice in the last 12 minutes to take the title. Yardley native and former Lower Merion Soccer Club player Joe Braun won a national title as part of the Tufts University Jumbos. Tufts defeated Calvin College, 2-1, in Greensboro, North Carolina. It was the Boston school's third national championship. Congratulations to Joe and the Jumbos! Anneliese Jennings (Warminster, Montgomery United) claimed a national title with Bridgeport University. The Purple Knights beat Grand Valley State, 1-0. Congratulations, Anneliese! Former Penn Fusion and ODP player Rachael Dorwart and the University of North Carolina Tar Heels came up just short in pursuit of the school's 22nd national championship. Florida State defeated UNC, 1-0. Morgan Hackworth, a Wallingford native and son of former Philadelphia Union coach John Hackworth, will head back to the Men's College Cup next weekend. Akron defeated three-time defending champion Stanford, 3-2, in the quarterfinals this weekend. Akron heads to Santa Barbara for Division I soccer's final four.